While it may seem as though school has just begun, high school seniors’ attention has already turned to what’s next after high school. The All Hands Raised Partnership is focused on supporting our schools as they work to strengthen these paths for their students regardless of whether than plan includes college or career training. Simply having a plan (and the support to execute that plan) makes a difference. An important step in ensuring the plan is actionable includes filling out critical financial aid forms known as FAFSA and ORSAA. 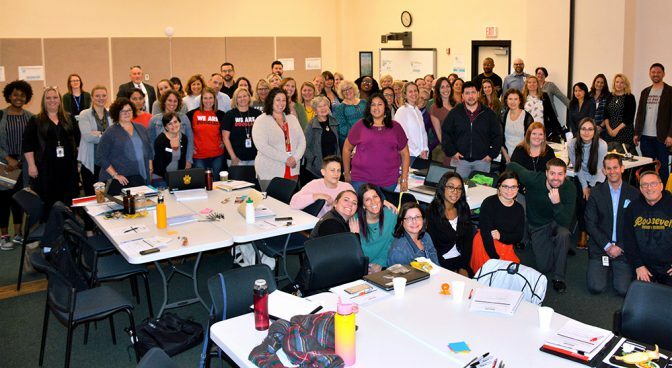 Since 2015 the Partnership has focused on this key gateway to post-secondary access, and yesterday (10/3/18) All Hands Raised convened more than 60 counselors, administrators and community partners from seven partner school districts for its annual FAFSA/ORSAA kick-off. The purpose of this workshop is to spread insights, knowledge and tools with the goal of increasing completion of FAFSA and ORSAA forms. This community has come together in new ways over the last three years to ensure more local students are able to “choose where they go in life.” FAFSA completion rates by Multnomah County high school seniors are up 13 percentage points over the past five years. Click here to learn more about this work. Learn more about ORSAA, a financial aid program for undocumented students in Oregon here; and FAFSA and other student aid here. Thanks to workshop presenters from PPS Franklin High School, Parkrose School District, Multnomah ESD, Portland Community College, The College Place Oregon, OSAC and to all who joined together to share knowledge and strategies to access FAFSA and ORSAA financial aid opportunities.